Though the used cars may not be exciting a lot of viewers, but this one is worth taking a shot at. A Maserati and Ferrari dealership in Germany has putted up on sale a very rare Mansory SLR Renovatio for 219,000 EUR ($300,500). 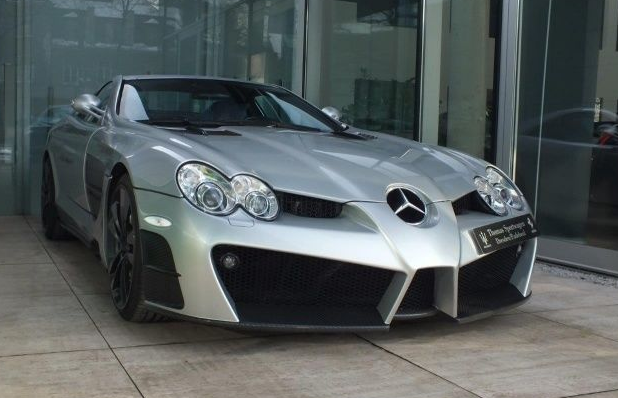 Under the skin it is the Mercedes-Benz SLR McLaren which is tuned to attract more eyeballs than it used to do before. The tuned SLR figures carbon fiber detail on the canvas of silver finish tripped inside as well as outside. Under the hoods, a 5.4-liter V8 engine of 626 HP (460 kW) at 6,500 rpm and 580 lb-ft (780 Nm) of torque between 3,250 and 5,000 rpm was found doing its duty perfectly even after clocking 25,000 km (15,500 miles) odo. However, the technicalities aren’t touched at all in the modification process, but due to the weight reduction, acceleration from 0-100kmph became two tenths quicker than the regular production version.